Heads up: Have you checked out the We Are Next Index? It's a crowdsourced directory of resources to help students and jr. talent start and slay in their careers. Check out the list and help us build the Index by submitting a resource you love! How they all found advertising almost by chance. Useful things to keep in mind as you’re starting your careers. What it’s like to work in advertising in Tampa Bay, and the benefits of a tight-knit ad community. Challenges and lessons learned from Ad 2 Tampa Bay’s diversity efforts. 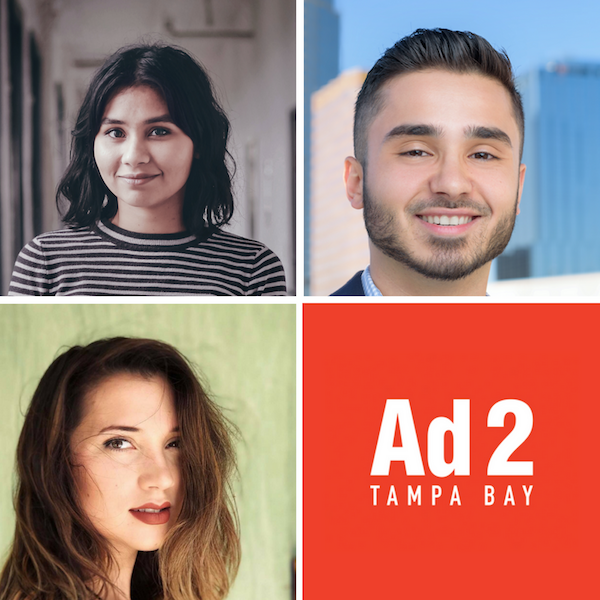 How Ad 2 Tampa Bay started an open forum community series, and advice for other groups wanting to create similar events. Small but powerful ways to advocate for diversity and inclusion as junior talent in your agency. "Companies will do what companies need to do for them. People need to do what's right for them as well. [...] I've realized that if you just do what is right for you, it'll all work out. Really set your own path, and you can make waves." By day, Kaitlyn is a copywriter for Dunn&Co. in Tampa, FL. By early morning, lunch hour, and night, she is the Incoming President of Ad 2 Tampa Bay. Kaitlyn is passionate about her fur babies, poetry, interior design––she’s remodeling her first home––and proving the power of advertising can be used for good. Born and raised in New England, Peter Iliopoulos has made Tampa Bay his home for the past eight years. Peter has extensive leadership experience with Ad 2 Tampa Bay, where he has served as Treasurer, Public Service Account Director and Diversity Director. His 9-5 is spent at Catalina Marketing where he is a Sr. Account Manager. When not working or at an Ad 2 meeting, Peter can be found at the Davis Island Dog Beach playing with his pit bull, Bernie. Mouzel is a Jr. Copywriter at PPK who crafts words for brands big and small. When she’s not at work, stuck in Tampa traffic, or socializing at the agency watering hole, you can find her at home writing tv pilots or at the beach listening to oldies and obsessing about surfing.